This time there was no escaping it. This was my last child, and this would be the end of our physical attachment. I cried in the mikveh when I did my weaning ritual at Mayyim Hayyim, the community and educational mikveh near Boston. We were all in the U.S. for my niece’s bat mitzvah, which was also in the Boston area. After the bat mitzvah, Jacob returned home with the kids, and I continued on to Mayyim Hayyim and then Manhattan for some speaking gigs as part of my book tour. That night, I stayed in a motel near the airport. Jacob dropped me and then returned our rental car and flew home with the kids. I went through my notes for my talk, which would be the next day at Mayyim Hayyim. But before the talk, I would do my weaning ceremony at the Mayyim Hayyim mikveh. Alone in that motel room, I put together my book of blessings from friends and relatives I had solicited for my weaning ceremony. They had emailed them to me, and I had printed them without reading them. I wanted to receive their blessings for the first time right before immersing. I pasted these blessings, without reading them, into the pastel flowered journal I had bought for this occasion. Although I was not reading the words, I cried as I pasted. The mere thought of Jacob and the kids flying back to Israel , leaving me alone for two weeks, was enough to bring on the tears. My feelings were mixed: liberation, loss, fear, excitement. This time there was no escaping it. This was my last child, and this would be the end of our physical attachment. I had been winding down the nursing over the summer, and I would not nurse her for two weeks, so by the time I returned home to Israel, the idea was that she would be weaned. My work breastfeeding my children was over. Now my parenting would be more on an emotional level; and my nursing of myself on a spiritual level would hopefully only intensify. At the water’s edge, I read from the book I had compiled the night before. I was touched by the candor and intimacy of these personal stories and blessings. The general theme was to embrace this new stage in my life while also appreciating what I was leaving behind. As I descended the circular stair case with its seven steps leading down into the black-bottomed oval mikveh with its underwater lights slowly changing color, I tried to be mindful of the many steps along my journey of birthing and raising my children thus far. During my first immersion, I closed my eyes and recalled life without children. I visualized myself back in college, always busy, but mostly with my own needs, rarely the needs of others. After reciting a blessing “upon immersing in the living waters,” I immersed a second time, this time trying to be present in the moment, to truly tune into what it feels like to be me, now, in this intense period of caring for others while also trying to care for myself. I then recited a blessing a friend had composed for my ritual: “Blessed are you, Source of all Life, who sanctifies transitions.” This was exactly what I was doing here in this mikveh at this moment — sanctifying this pivotal transition by recognizing, naming and sitting with my feelings around it. As I immersed my entire body for a third and last time, I tried to visualize myself with an empty nest. Despite having once been totally on my own, there was no going back to that unattached life. I had accepted Jacob’s engagement ring, stood beneath the huppah , and thrown myself into birthing and parenting. I had no doubt that mothering seven children would help me appreciate my “freedom” even more; but I also had no doubt that there would never be complete freedom again. As I recited the final blessing — “Blessed are You, Majestic Spirit of the Universe, who gives me life, sustains the rhythms of my body and brings me to this moment of renewal” — my tears mixed with the living waters of the mikveh. I was overcome with the emotion of having reached this moment after months and months of anticipation, planning, and fear. But fear of what? I asked myself. Fear of having no one to take care of but myself. Fear of entering a phase of open possibility. Fear of having my life back and not knowing what to do with it. Fear of the unknown. I had passed over this particular bridge. I had managed to turn off the switch of the whirlpool and let the waters settle. Now all I had to do was wait, to see what would float to the surface. Rabbi Haviva Ner-David is a writer, rabbi, mikveh specialist and spiritual counselor. She is the founder of Shmaya: A Mikveh for Mind, Body and Spirit, at Kibbutz Hannaton, where she acts as a mikveh guide and consultant. She has two published memoirs with Ben Yehuda Press (Life on the Fringes: A Feminist Journey Towards Traditional Rabbinic Ordination, and Chanah's Voice: A Rabbi Wrestles with Gender, Commandments, and the Women's Rituals of Baking, Bathing and Brightening) and the forthcoming Getting (and Staying) Married Jewishly: A Guidebook for Couples. She is currently working on a novel about the friendship between a Palestinian-Israeli and a Jewish-Israeli woman. This piece is an edited excerpt from a third memoir that is in the works as well. 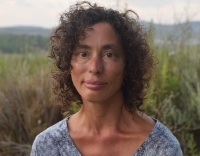 Haviva is a spiritual counselor (for both individuals and couples) with a specialty in dream work, and she often combines her counseling work with mikveh immersion rituals. She lives on Kibbutz Hannaton with her life partner, Jacob, and their seven children.